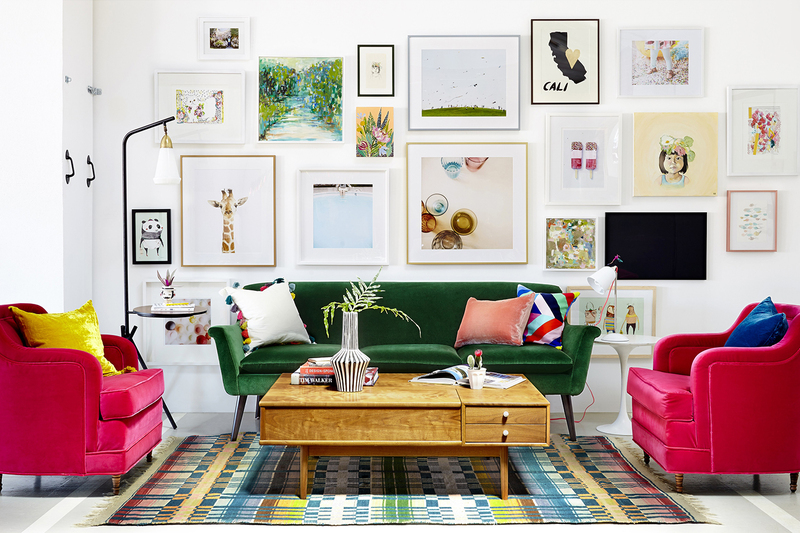 So you want to put a gallery wall in your home. Simple, right? We all know that this is definitely NOT the case. Starting your gallery wall can be a daunting task. There’s so much that can go wrong (uneven spacing, goofy placement, crooked frames, etc. ), and you don’t want to be unsure of your design and end up putting extra holes in the wall. Luckily, we’ve managed our fair share of gallery walls, so today we’re sharing our tips for getting the gallery wall look you’ve always wanted. Before getting started, here’s an easy strategy to avoid doing any unnecessary damage: Buy some craft paper from your local arts and craft store, and trace each frame you want to use onto the paper and trim to size. As you follow the rest of this how-to article, tape your craft paper cutouts to the wall with painter’s tape until your gallery wall is perfect. Then go ahead and hang the real pieces. To get started, anchor the wall with your largest statement piece first. As you continue placing pieces on the wall, going from largest to smallest is typically a good strategy. The larger pieces will serve as a guide for your other, smaller wall art. Remember that every gallery wall needs at least one piece that feels commanding enough for the eyes to immediately gravitate toward. Gallery walls consist of five to six pieces at minimum, so if you don’t have this much to hang, consider hanging your pieces separately or as small vignettes. Always make sure to vary the size and orientation of your gallery wall art. Including vertical, horizontal, and square art will ensure your gallery wall is visually balanced (the only exception is if you’re going for a super symmetrical, non-salon style installation). If you find yourself stuck with an awkward space, remember that a small starburst mirror or another piece of hanging wall decor can be incorporated into your gallery. Don’t make the mistake of drawing the line at art. Keep the gaps between your pieces relatively even and at least 3 inches apart so the gallery doesn’t look crammed. Also make sure no piece is too far from all of the others, or it might look strange, like it was hung there by mistake. Make sure the frames you choose for your art pieces are within your color palette. Every frame doesn’t have to be the same (it can be a lot of fun to mix it up! ), but you don’t want any of your pieces to stick out like a sore thumb. After you lay out the gallery with craft paper, take a step back to see what the gallery will look like as a whole, and make any minor spacing adjustments. We additionally like to lay the gallery out on the floor first too so you can see each of the pieces next to each other to ensure they compliment each other well. Because the real key to a stunning gallery is simple: great art. Shop some of our favorite wall art pieces below, and get started on that gallery you’ve always wanted! And if you want more advice on hanging wall art, don’t miss our previous wall art article. This article originally appeared as a contributing article to our friend The Chriselle Factor. This version has been updated and modified. Have questions or comments? Let us know in the comment section below!